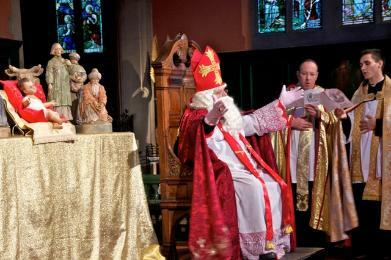 St Nicholas greeted over 2000 persons individually on his last appearance in 2012 on 22 December at St Pauls Cathedral. The Carol Service was so popular, over 800 were turned away as there was "no room". Prayer cards were given to 100s of young children by helpers Jill, Margaret and Lynda. The Nicholasfest 2012 in the president's parish and village, St Nicholas at Wade, Kent was an enormous success with over 700 passing through the refurbished church from 1-9 December and took much energy from Fr Jim. The highlights included the Blessing of the Newly Refurbished building by the Bishop of Dover; the St Nicholas Day Lantern Procession and Pub stops; and the splendid concert with the Haydn Mass of St Nicholas and Britten St Nicolas Cantata. Support from the St Nicholas at Wade Village Council enabled all to happen with co-operation of the church and Bonnie Clark and her team of hospitality providers. Stunning array! Our founder Canon Jim Rosenthal has published a village themed book and activities called A SAINT COMES HOME, it sells for £3.99 (There is also a splendid new guide book for St Nicholas at Wade Church). 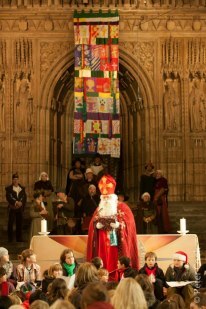 Canterbury 2012 found record numbers participating, as it was also Archbishop Williams last time with us! 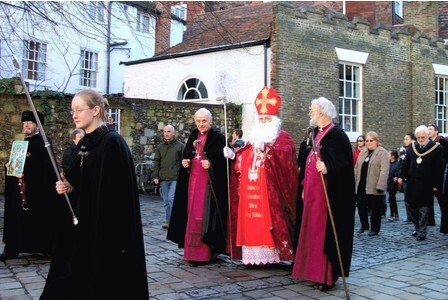 It should be noted St Nicholas (our president) appears at the request of the St Nicholas Festival, a separate organisation born out of the SNS original celebrations in Canterbury. The fest has raised over £55,000 for charity over the last 5 years or so. 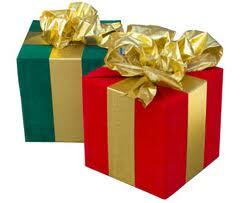 The SNS send funds to Bethlehem University and St Nicholas Church Beit Jala when we can. The president asked Roger Hobcraft, a professional actor and one of Fr Jim's parishioners, to supply for him at the St Nicholas appearance at St Pauls Knightsbridge, London surrounded by Sir Terry Wogan and stars from Downton Abbey, no less. (Last year it was a Spice Girl). It was great fun I am told. 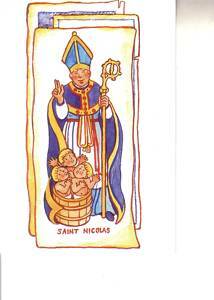 The SNS Nicholas appeared on Dec 2 at St Nicholas Church, Ash, Kent for their patronal festival. He also appeared at St Lawrence College in Ramsgate. 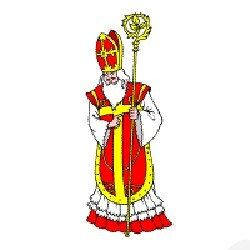 James Read, also from Thanet, appeared as St Nicholas for the St Nicholas at Wade Gift Service and Roger Hobcraft again on St Nicholas Day at the mass in the church and the Dec 3 School Service was done by James, with Fr Jim leading the service: The theme: The Legends of St Nicholas. 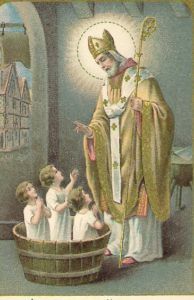 A highlight was St Nicholas appearing at a service in St Asaph Cathedral in North Wales, invited by their Bishop, the Rt Revd Gregory Cameron. This was one of the areas heavily hit by floods in November 2012. A DVD released in Australia features highly Canon Rosenthal speaking on St Nicholas (Charting Christmas by Gary Wilkinson). 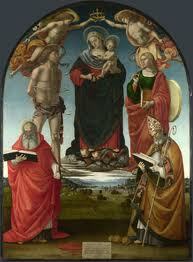 Fr Jim also has dione a 4 Sunday slot on BBC Radio Kent in Advent. There has been some local press coverage as well. 11 May set as AGM, location TBA, ideas? There are some that believe it will not be long before the true Christmas story will be foreign to children. This celebration is one, not the only, way to encourage the young in their faith and in appreciation of customs of the past, brought to life in our time. Christians must reclaim CHRIST-MASS, and in reclaiming St Nicholas we find one way of making that happen in today's world. Discover with us the joy of knowing the real Santa Claus and Father Christmas. He is St Nicholas, born in 260 AD and died on 6 December 343 AD but lives in the hearts and minds of many many people around the world. 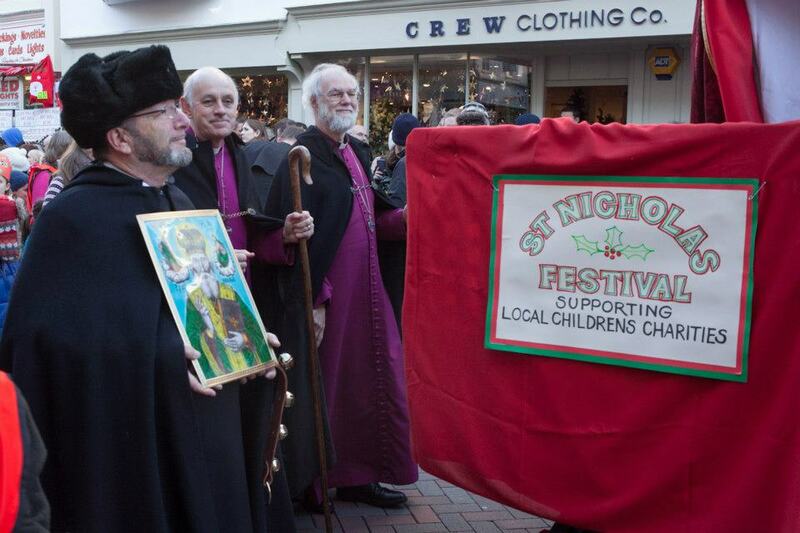 The photo on the left shows what one church did to receive and celebrate St Nicholas. You can do the same. (St Michael and All Angels Anglican Church, Bedford Park, London). The founder, Dr Jim Rosenthal says, "There is a bit of St Nicholas in all of us." The St Nicholas Society, along with the St Nicholas Centre website, allows you to seek and find the amazing legends and miracles of this great man called Nicholas and we trust will inspire you to join us in our pledge to have Santa discover his roots. Dr Rosenthal says, "When you see a Santa Claus on the streets go to him and say that you know his real name and say hello St Nicholas!" 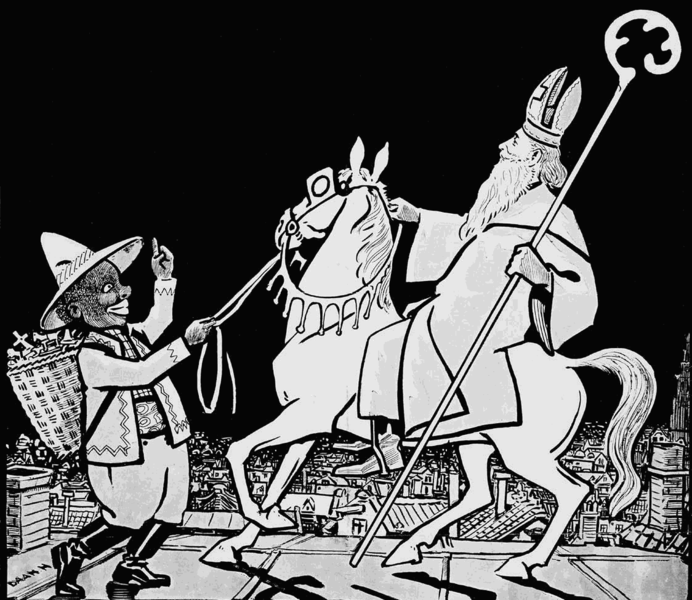 LEFT: A typical cartoon image of the real Santa Claus! Your donation via PAYPAL would be much appreciated. We believe the season of Advent opens people of all ages to the joy of giving and receiving in appropriate ways. 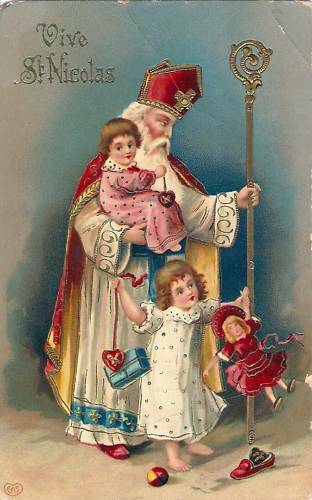 We trust that people will follow St Nicholas in helping those in need as best as we can and that such action, mingled with prayer, may bring hope and fulfillment to many in our busy world.